Leading WA transport and logistics company, Busselton Freight Services (BFS), has recently added four new trucks to its subcontractor fleet of DAF prime movers and rigid trucks. Tony Berry's involvement in the Tasmanian transport industry goes back over 25 years, including 18 years with TOLL Transport. Brown & Hurley - Yatala, part of Australia's largest and longest-serving truck dealer group, has been crowned 2010 DAF Dealer of the Year. The win makes it a record fifth time for the Brown & Hurley Group. Award-winning Melbourne dealer - Hallam Truck Centre - has been named DAF Dealer of the Year for 2009, following an impressive year of sales and customer service. Leading supermarket chain Woolworths has just taken delivery of 18 DAF CF85 prime movers as part of its commitment to operating the most environmentally-friendly and safest trucks on the road. DAF Trucks Australia has been honoured with the Motoring Matters Transport Technology and Innovation award for significant reduction in driver fatigue. 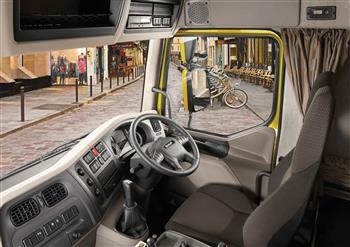 The new DAF LF 250 12T, interior.